FCC Considers New Privacy Regulations For Broadband Provideres : The Two-Way On March 31, the Federal Communications Commission will vote on what could become first-ever privacy rules for Internet service providers, stemming from last year's net neutrality ruling. 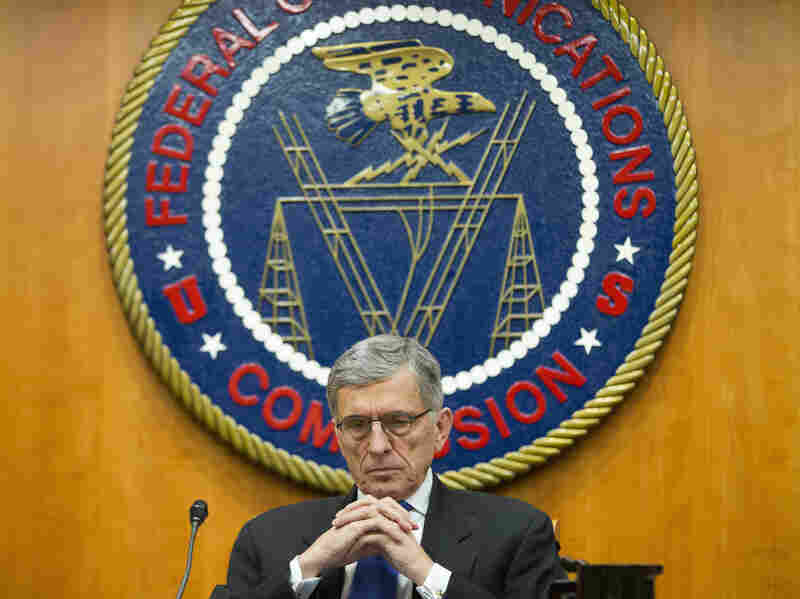 FCC Chairman Tom Wheeler is proposing first privacy regulations for Internet service providers. Thursday's unveiling of the proposal from Chairman Tom Wheeler is just a first step: The FCC is expected to vote to formally propose this plan on March 31, soliciting public comments on a variety of questions about how the rules should work before the final version gets drafted. The key elements of Wheeler's proposal include a requirement that broadband providers such as Comcast, Verizon or T-Mobile clearly disclose what data they collect on you — for instance, it could be browsing history, use of apps or location — and how they shared that collected data with other companies for marketing or other purposes. In some instances, subscribers would be asked to opt in or they'd be given a choice to opt out, depending on how the information is used. (Re/code has a helpful breakdown of the details.) The proposal also has provisions for better security of the information traveling through ISPs' networks. "Your ISP handles all of your network traffic. That means it has a broad view of all of your unencrypted online activity — when you are online, the websites you visit, and the apps you use. If you have a mobile device, your provider can track your physical location throughout the day in real time. Even when data is encrypted, your broadband provider can piece together significant amounts of information about you — including private information such as a chronic medical condition or financial problems — based on your online activity. "The information collected by the phone company about your telephone usage has long been protected information. Regulations of the (FCC) limit your phone company's ability to repurpose and resell what it learns about your phone activity. "The same should be true for information collected by your ISP." "The regulations, if approved, would put broadband providers under stronger privacy oversight than Internet companies like Google and Facebook. Those companies are monitored by the Federal Trade Commission, whose ability to create specific privacy rules is limited. "Many privacy advocates have pushed for a greater role by other agencies because the F.T.C. cannot create rules for online privacy and can only monitor data collection practices as an enforcement agency." "Given the realities of this complex market, there is no basis for treating ISP data as somehow 'proprietary' or subjecting ISPs to unique privacy requirements. Consumers expect and deserve consistent privacy protections for their online data, regardless of which company is collecting it and the technology used to collect it. "The FCC appears to want to place its thumb on the scale in favor of Internet companies and against the companies that invest in broadband infrastructure in this country."